 "The name of Algerian singer-composer Idir means 'He will live' - it's a term bestowed by mothers fearing for the survival of their babies in his remote home village. But it also parallels his music, which helps to keep alive the Berber traditions. Idir's first hit was 'Avava lnouva' (The Little Father) in 1973, which has been translated into seventeen languages and acquired an almost hymn like status. Celtic music might sound a surprising choice to combine with that of North Africa, but Idir has found irresistible shared roots.His down to earth soul managed to spread the rhythms from the enchanting highlands of Djurdjura to a wider modern audience, by embarking on a profound shared roots voyage in the emphasis of storytelling and the appreciation of nature. Idir regards singing as a celebration of his origins and a permanent quest for universality.His collaborations and duets include the Breton Alan Stivel, the Celtic Karen Matheson, Manu Chao (Clandestino), and the French cult figure Maxime le Forestier."